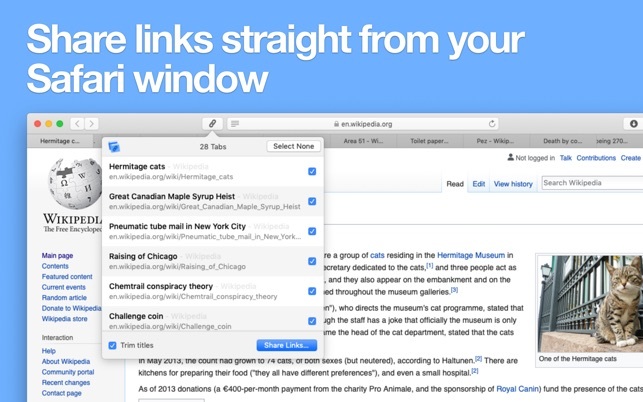 Make a list of links from your open tabs in Safari, instantly. Take your browser window of research straight into an email to send to a friend, create footnotes for your paper, or drop links into the show notes for your podcast. Tabs to Links detects open pages and can trim repeated text from the end of the titles automatically. Frequently, websites append their site name to the end of a page title. Trim titles detects this repetition automatically and strips it when sharing the links. Export links to the clipboard for pasting into any other app or use the system sharing options like Notes, Mail and Reminders. Just hit Command+C inside Tabs to Links to copy the current list to the clipboard, ready to paste into any app on your Mac. Access Tabs to Links with the standalone application or click a toolbar button into your Safari window, using the Tabs to Links Safari extension. The extension offers the essential Tabs to Links features and requires macOS 10.14.4 or later. You can even export links as Markdown list syntax or a simple plain text list to integrate into your existing workflows. Tip: Hold the Option key to share links as bare URLs, ignoring titles. The standalone Tabs to Links app uses Apple Events to function. 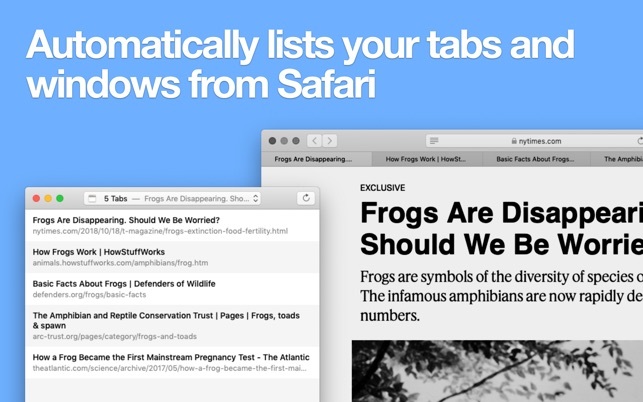 You will need to grant permission for Tabs to Links to control the Safari browser on your Mac. Tabs to Links operates locally and does not have access to your browsing history. 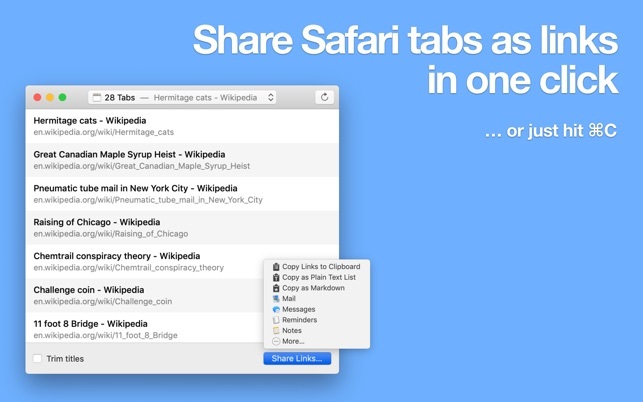 The Tabs to Links Safari extension uses Safari Extension API to load data about the open tabs in the window. Tabs to Links operates locally on your machine and does not have access to your browsing history. - Addresses a parsing issue with URLs involving # symbols. I love the idea of this app, but my primary use case was being able to quickly copy/paste a set of bookmarks in to apps like FSNotes, vim, etc. which don't support "rich text". To copy the links in a tab, I can't just hit "Cmd-C" (which just copies the tab titles), instead I have to use the mosue and click on the "Share Links..." button and then choose "Copy as Plain Text List". * It would be nice to have a "blacklist" of sites to always exclude. I have pinned tabbed for things like my email, task manager, etc. and these tabs show up in every window selected via the dropdown menu. * Checkboxes next to each tab to would be nice as a quick way to exclude a tab or two without having to actually close the tab or move it to another window. Thanks to the dev for quickly updating the app to at least be able to copy titles *and* URLs as plain text, as that was not possible at all in the first release. We updated the app to add plain text support and Markdown export. You can also now select 'All Windows' as an option. Does this address your issues? If it does, we would appreciate if you could update your review as appropriate. Now Definitely a Five Star App! Below was my original review. I also emailed the developer with other issues that I thought needed improvement. I didn't get an email reply, but my feedback was definitely taken into account and all of the things I mentioned have been fixed. 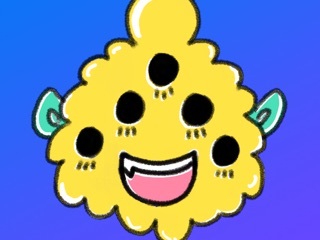 I love this app now. It is a great way to archive a set of links from research sessions. Great job! Echoing the other reviews - I bought this assuming it would copy and paste titles and URLs into plain text contexts. 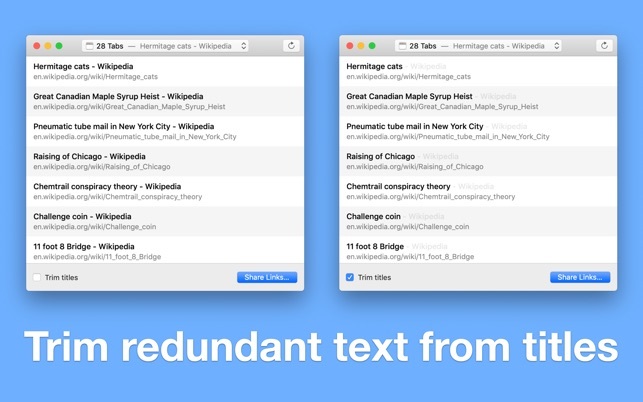 As it is now, you can only choose to copy plain text titles or plain text links (with the option key held). Also, exporting Markdown titles / links was also something I just figured this would have. I'm giving it 3 stars because it is a good application and done well. I'll update the review to 5 stars as newer versions add the expected features. A simple, handy app to have for note taking and automations! I got this app after reading about it on MacStories and was a bit disappointed that a Markdown option wasn't available but it was updated within two days of my purchase! The "regular" plain text option now includes both the title and url.